The olosapo is a bit like what would happen if sweet eggs hatched from a tree. 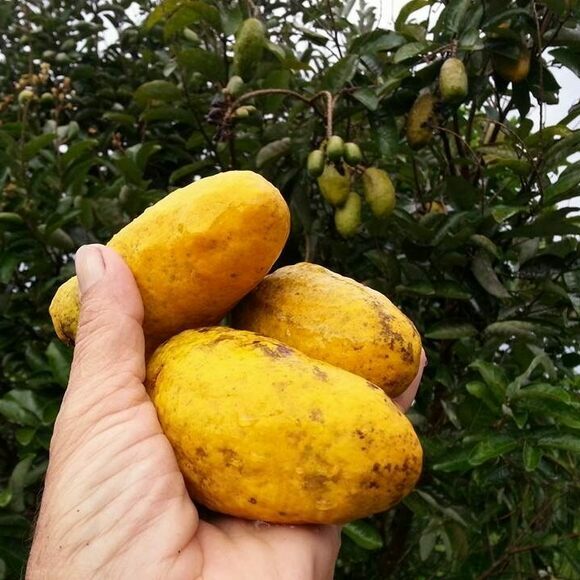 This Central American fruit is rarely sold commercially. The best way to find it is by foraging in its native habitat. Unripe fruit is green and extremely astringent, so be sure to wait until the skin turns bright yellow, with lumpy pockmarked skin, and yields to light pressure. When in doubt, the best way to tell that it’s ready to eat is to wait until one falls to the ground and hope that you get to it before any animals do. The olosapo is not typically sold commercially, but if you’re traveling through its native range—particularly from Southern Mexico to Costa Rica—keep an eye open for the fruits growing in the wild or in someone’s yard. Belizeans use this bulbous fruit to kill mosquito-borne parasites. A “royal rat” that's fit for a queen. This fruit can also count as dessert.